The Asus Strix SCAR II GL504GW gaming laptop is an impressively lithe little beast, sporting the second tier of Nvidia’s latest graphics card range, but ditching the Max-Q design in favour of full fat frequencies. And so long as you’re wearing a decent gaming headset that choice will fill your eyes with crisply rendered pixels and your gamer’s heart with joy. Why the headset? Well, gaming at high frame rates on a non Max-Q RTX 2070 is going to get mighty loud after a while, and you’re going to want to have some effective ear-shielding to be able to carry on gaming regardless. Though spare a thought for any loved ones in the room or co-passengers on the train, they have ear-holes as well. Nvidia launched the latest range of mobile GeForce graphics cards earlier this year, with every gaming brand of note releasing new laptops to take advantage of the fresh GPU silicon on offer. If you could then claim your notebook was a mobile real-time ray tracing monster, you would too. The $1,899 (£1,900) Asus Strix SCAR II is the second Turing-based laptop we’ve tested so far, both using essentially the same graphics card, the RTX 2070. But there is one big difference between them and that’s because the Gigabyte Aero 15 X9 uses the Max-Q design version in order to make the most of the slimline aesthetic that has become the Aero’s raison d’etre. 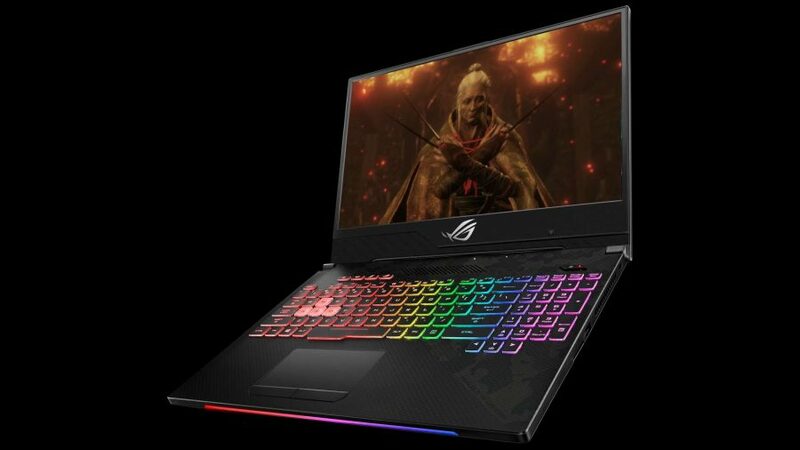 The Asus notebook has gone for the full spec GPU option, not restricting either the temperature or the noise of the mobile GPU’s cooling array in favour of getting the highest frame rates possible for your gaming pleasure. And that can easily be seen in the relative performance of the two Turing chips used in the Gigabyte and Asus notebooks. 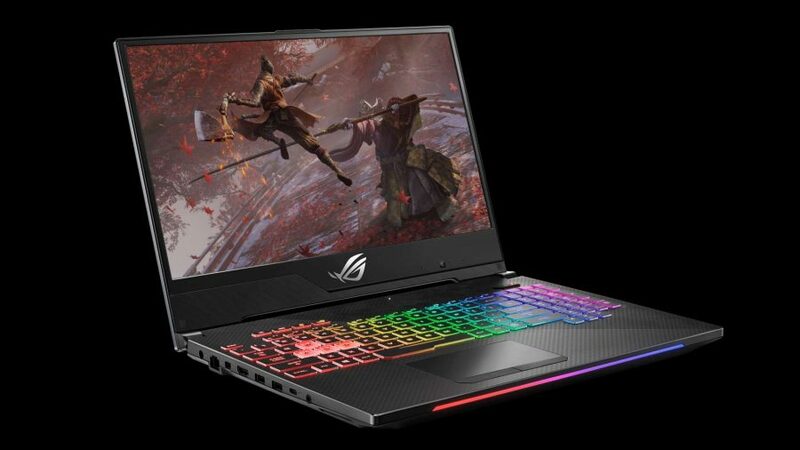 As the cheaper choice of the two RTX 2070 laptops the Asus Strix SCAR II has opted for the Core i7 8750H CPU as opposed to the i9 8950HK the Aero 15 X9 used. Both are six-core CPUs, with 12 threads, but the i9 is capable of clocking a little higher. Which doesn’t really help that much in the grand scheme of things given that the thermal limitation of the Aero’s tighter chassis levels up the playing field for most of the time. The SCAR II also has 16GB of DDR4, mercifully arrayed in dual channel mode so as not to immediately halve the memory bandwidth… as companies were wont to do in the last generation of gaming notebooks. This version of the 15-inch machine is kitted out with a 512GB PCIe SSD and a 1TB SSHD data drive as backup. 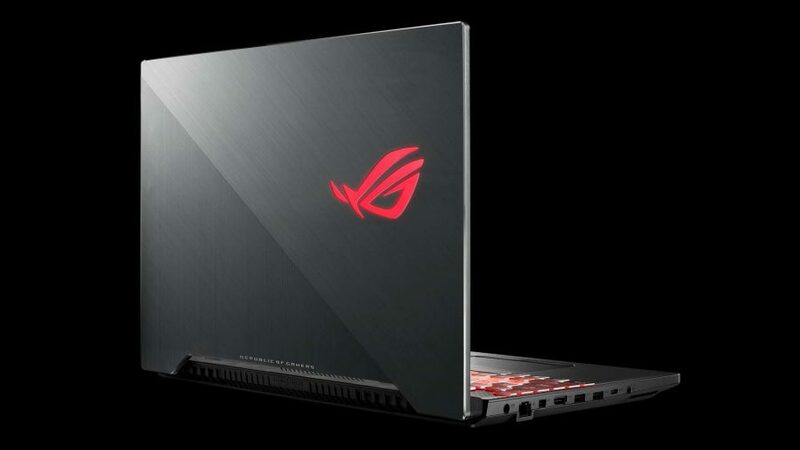 But Asus has noted the Aero 15’s trick and squeezed its vibrant, 15-inch, 144Hz, 1080p panel into a modest chassis with an impressively minimal bezel. The chassis itself is not quite as slim, nor are the bezels as slender as the Gigabyte machine, but considering the scale of previous Asus gaming laptops, it really is a seriously svelte mobile PC. It is around 400g heavier than the latest Aero 15, and a bit thicker too, but it’s still not anywhere near the unwieldy level of Asus passim. This is a gaming laptop slight enough to slide into a sachel, but powerful enough to deliver serious frame rates too. While the Asus Strix SCAR II does get loud when gaming at full chat, the performance delta between the more-expensive Aero 15, with its Max-Q version of the same GPU, is huge. At some points the difference between the two RTX 2070 chips is as wide as 34%… you’re leaving nowhere near as much gaming performance in the tank with the Asus machine. The mix of RTX 2070 with the 144Hz gaming panel delivers an experience that’s slick, smooth, and glorious to look at. Even in Battlefield V, with the full RTX ray tracing and DLSS features in play, we’re seeing the SCAR II hitting 75fps on average. Metro Exodus is a little more demanding, only giving us 54fps on average with all the RTX bells and whistles, but that’s still more than 25% quicker than the Gigabyte machine. Even though it’s sporting a nominally slower processor, the Asus Strix SCAR II is capable of sometimes outshining the Core i9 used in the Aero 15 as well. The fact it’s a little broader allows the SCAR II to get more out of its mobile six-core CPU than the constricted insides of the Gigabyte laptop. Don’t get me wrong, I still love the Aero 15. 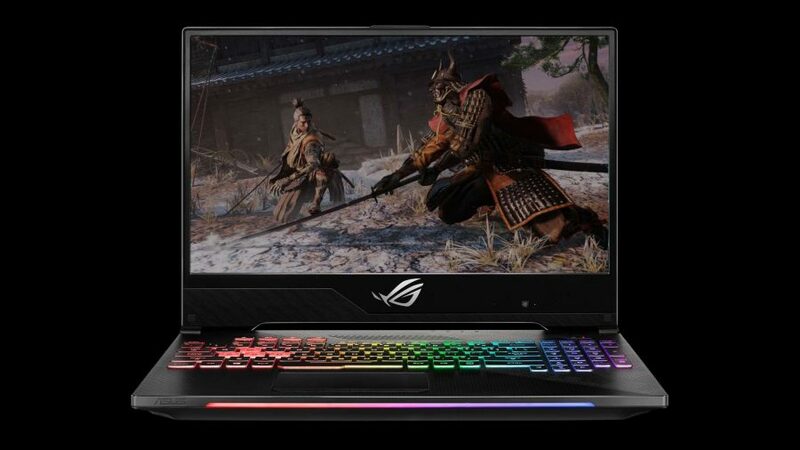 But if I was looking for a serious gaming laptop to carry around with me, I’d struggle with the far higher price tag and the knowledge of just how much gaming performance I was missing out on. The Aero 15 is a more svelte machine, but only by a relatively small margin; it’s a laptop that really makes you decide whether portability or performance is the deal-breaker for you. A fantastic gaming laptop, with a decent price tag considering its high-end components and top-spec gaming performance. And all in a package that won't break your back... or your lap.